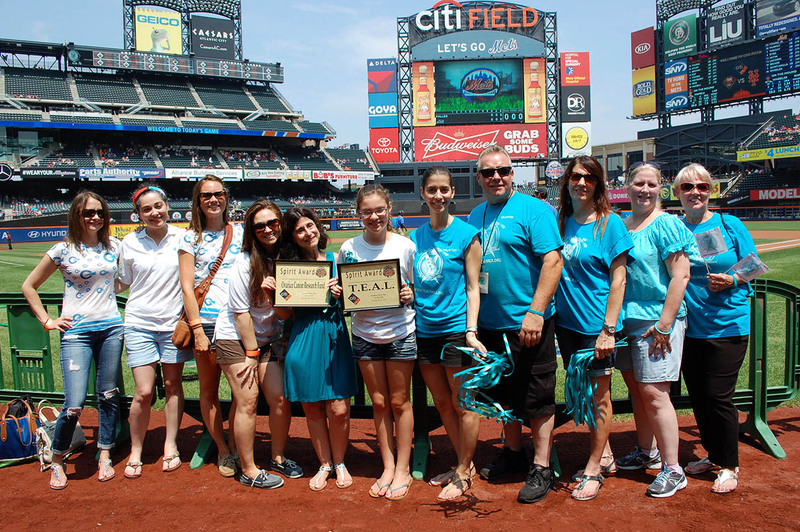 Saturday, July 20 2013 – The Flatlands Lions joined hundreds of teal wearing fans to fill the Pepsi Porch at Citifield for the 2nd Annual Ovarian Cancer Day, The event was a joint venture with T.E.A.L. and the NY Mets, who were hosting the Phillies at the stadium this day. 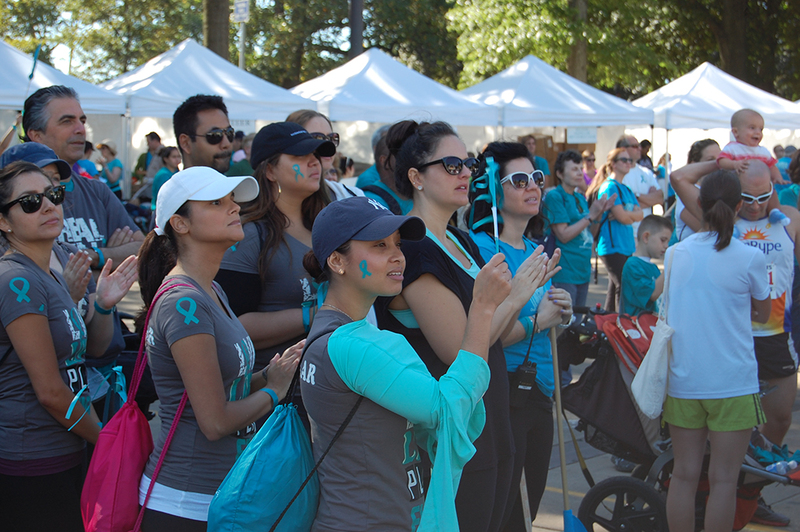 T.E.A.L., which stands for “Tell Every Amazing Lady” About Ovarian Cancer, the Louisa M. McGregor Ovarian Cancer was founded by two sisters from the Flatlands Lions, the late Louisa M. McGregor and her sister, Pamela Esposito-Amery. Although a grassroots organization, T.E.A.L. 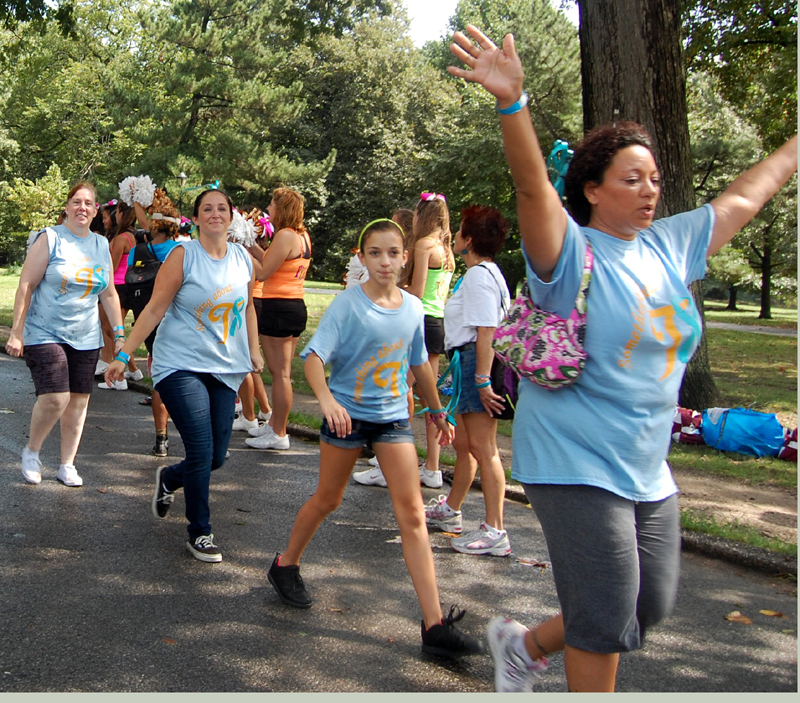 is the organizer of the largest Ovarian Cancer walk in NYC. Part of the proceeds of all T.E.A.L.ticket sales was donated by the Mets, to help the organization in its fight against Ovarian Cancer. Public information announcements about Ovarian Cancer were made on the large screens around the stadium during the game. Keith Hernandez, who was on hand to emcee the first burger eating contest held by N.Y.’s own “Brooklyn Burger”, took time to lend his support to T.E.A.L. Pamela Esposito Amery, the executive director of T.E.A.L.., was presented by the Mets with its Spirit award at a pre-game ceremony, in recognition of the invaluable work T.E.A.L. has done to combat this deadly disease, which claims the lives of 15,000 women in the U.S. alone each year. 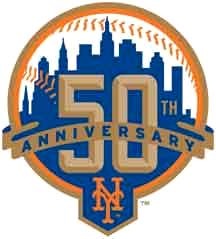 The Mets eventually won the game 5-4, in a hard fought contest that was close until the very end. 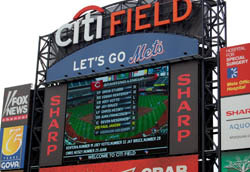 But the biggest play was not made between the foul poles – the Mets scored their biggest run by making ovarian cancer awareness and prevention a part of the lives of thousands of their fans, and for helping T.E.A.L. 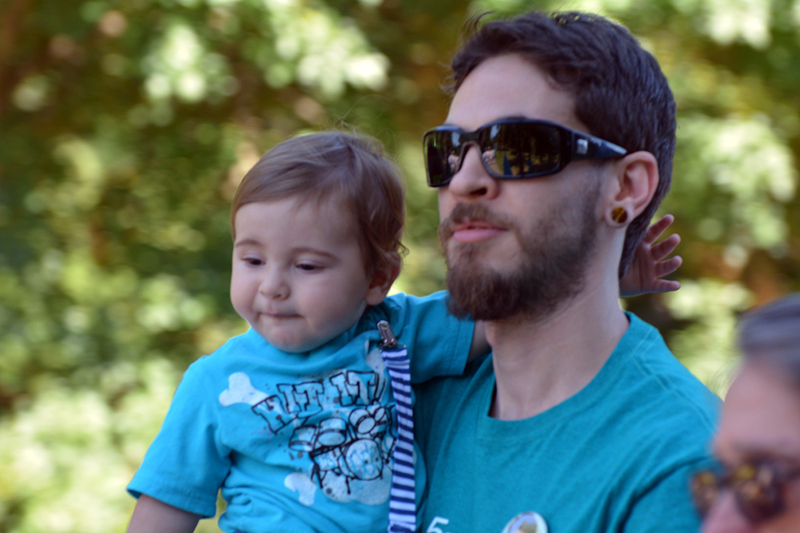 in its fight against this devastating illness. A special thanks to the NY Mets for their support and for the great work that they do year-round in the community. April 14, 2013 – T.E.A.L. 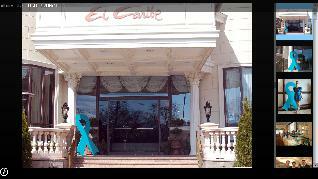 had its first Annual Spring Brunch Fundraiser at the elegant El Caribe Club in Brooklyn. 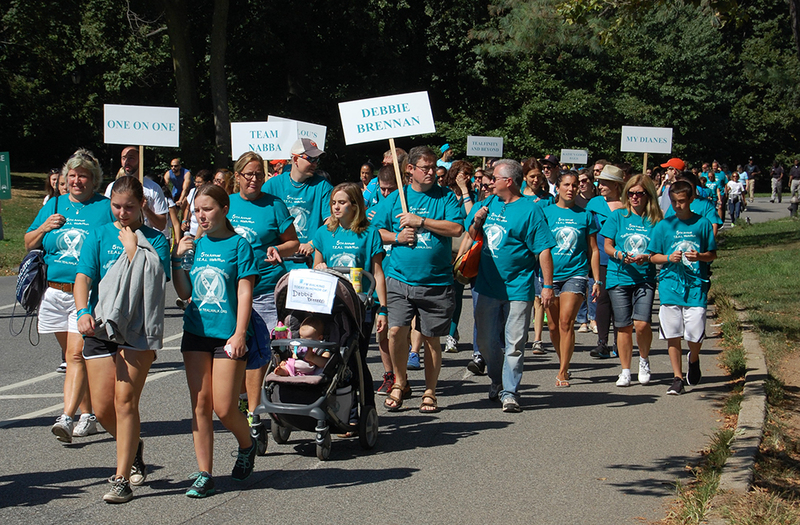 T.E.A.L., which stands for “Tell Every Amazing Lady” about Ovarian Cancer, the Louisa M. McGregor Ovarian Cancer Foundation, has taken its fight against Ovarian Cancer beyond the annual September T.E.A.L. Walk, into a full time, year-round effort. 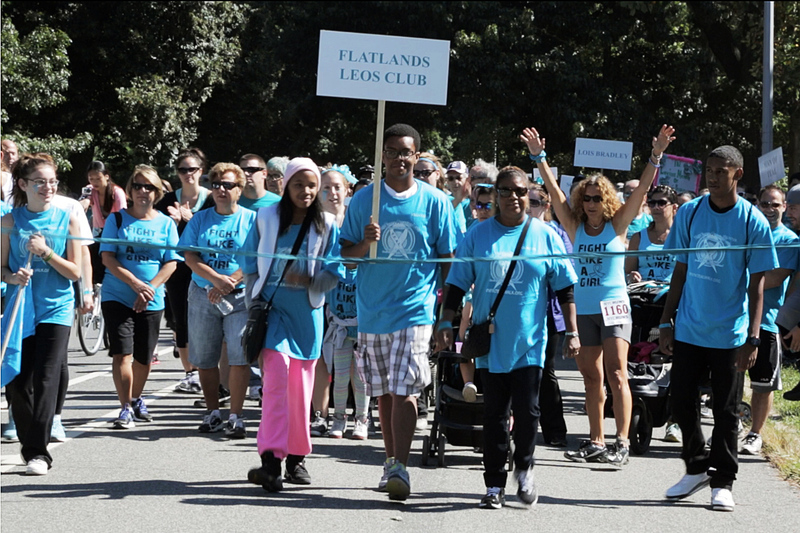 Founded by Flatlands Lion Louisa M. McGregor, an Ovarian Cancer survivor, and her sister Lion Pamela Esposito-Amery, the current executive director, T.E.A.L has taken the lead in promoting awareness, early detection, and has raised over $300,000 for research since 2009. Guests included Stacey Sager of Channel 7’s ABC News, and speakers: Ovarian Cancer Survivor/Triathlete Jenn Sommerman, Ovarian Cancer Survivor Ivette Alicea, and Ivette’s daughter, Miss Staten Island, Amanda Alicea. 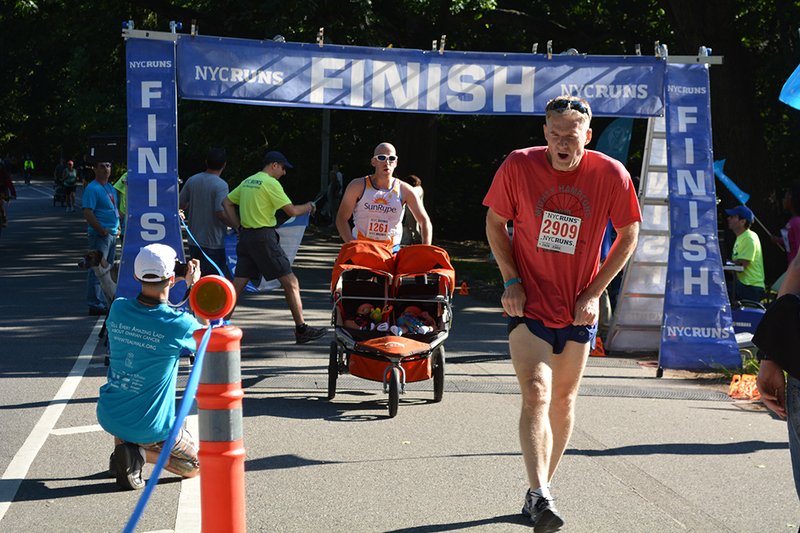 The brunch was hosted by WPLJ 95.5’s Race Taylor, who delayed his vacation in order to attend, flying out to meet his family after the conclusion of the event.Flatlands Lions, Brooklyn Metropolis Lions and Park Slope Lions and District 20-K1 Lions all provided support for the event. 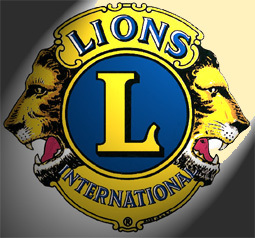 Flatlands Lions 2nd Vice President Larry Esposito, who is also a board member and treasurer of T.E.A.L. spoke in memory of his daughter Louisa, who passed from the disease in 2011, and whose guiding spirit lives on in the invaluable work T.E.A.L. continues to do. 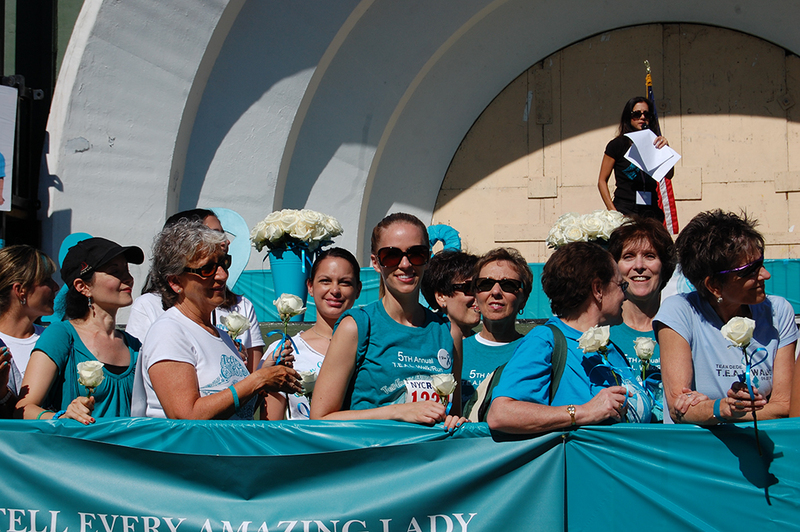 At the event, T.E.A.L raised $16,000 to continue the fight and to help to “Tell Every Amazing Lady” about Ovarian Cancer. 4th Annual T.E.A.L. Walk Marches On! 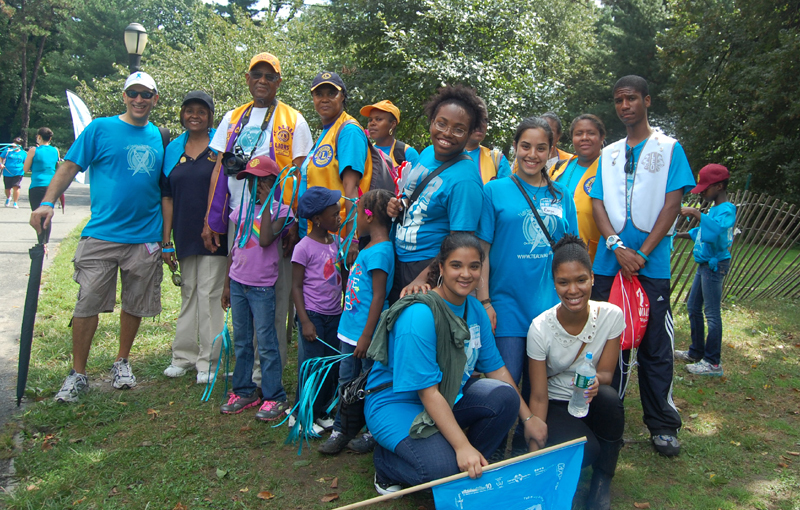 September, 08, 2012 – The 4th Annual T.E.A.L.. 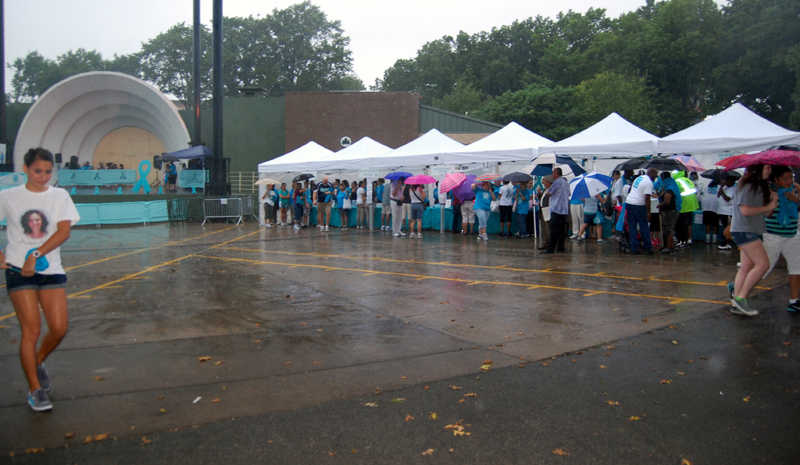 Walk for Ovarian Cancer was held in Prospect Park, marked by torrential rains that rapidly flooded parts of the 5K course, and forced participants and volunteers to seek cover for almost an hour. T.E.A.L., which stands for “Tell Every Amazing Lady “, the Louisa M. McGregor Ovarian Cancer Foundation, was founded in 2009 by two Flatlands Lions, Louisa M. McGregor and her sister Pamela Esposito-Amery, the organization’s executive director, while Louisa was battling ovarian cancer. She and Pamela wanted to combat the appalling lack of adequate information and frequent misdiagnoses prevalent in ovarian cancer by championing awareness, education and early detection. Although Louisa sadly lost her heroic 4-year battle in March of 2011, the work she and Pamela started continues to grow. Since its inception, T.E.A.L. 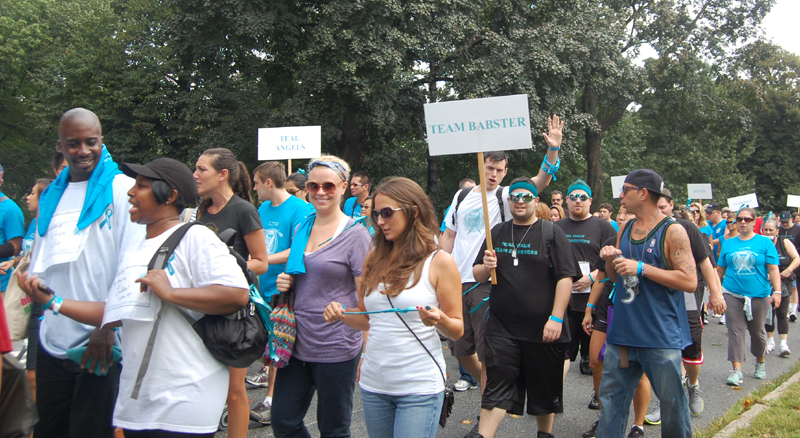 has promoted ovarian cancer awareness for thousands of women and has raised over $200,000 for research at three annual walks. But on this day, as sheets of rain fell from the sky during the event registration, the future of the 4th Annual T.E.A.L. Walk was in serious doubt. The situation quickly deteriorated, as increasingly violent storms began to cause flooding and wind damage through the park. It was only later in the day that reports of two tornadoes touching down only a few miles away were confirmed. With T.E.A.L. organizers and park officials considering cancellation, voices began to emanate from the band shell. The Empire All Female acappella group, clad all in black, had taken center stage and had begun to sing. As their harmonies grew stronger and more powerful, undeterred by the pouring rain, their mood turned joyful, and it quickly spread throughout the crowd. Many walkers had refused to leave, huddling instead under booths that provided little cover from wind borne rain. 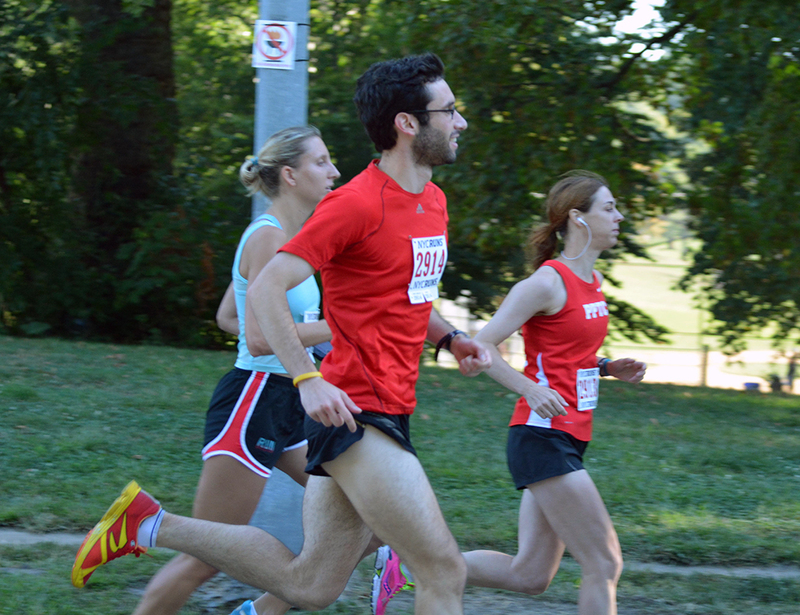 Others had fled to their cars or had run blocks to take shelter in local Park Slope stores. Some, already soaked to the skin, simply stood in the rain – and waited. The people who came to walk were here for loved ones, with memories of battles hard fought, with stories of incredible courage and wrenching loss held dearly in the names pinned to backs and held high on placards. 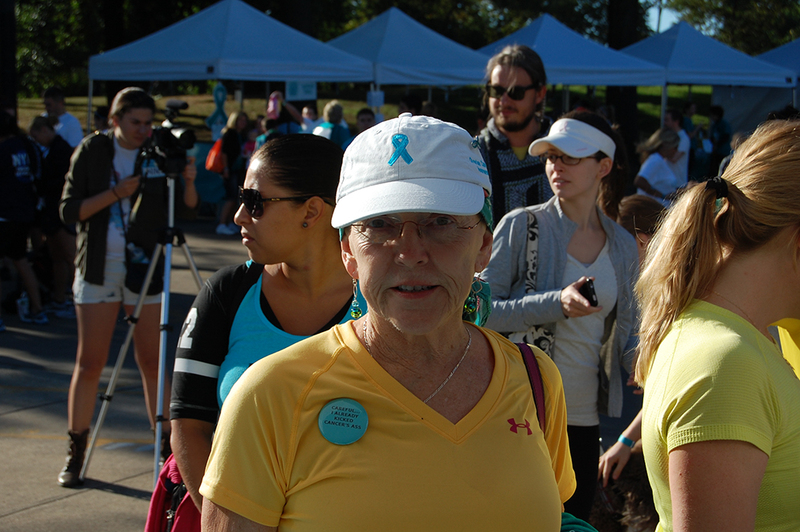 They were ovarian cancer survivors, with stories of victory and the ever present worry of battles yet to fight. Hope and disappointment were currencies well understood by all wearing teal. But today, hope had begun to ebb as the downpours continued without respite or end in sight. It took a simple act of defiance – a dozen rain-streaked faces raised in song – to get it back. 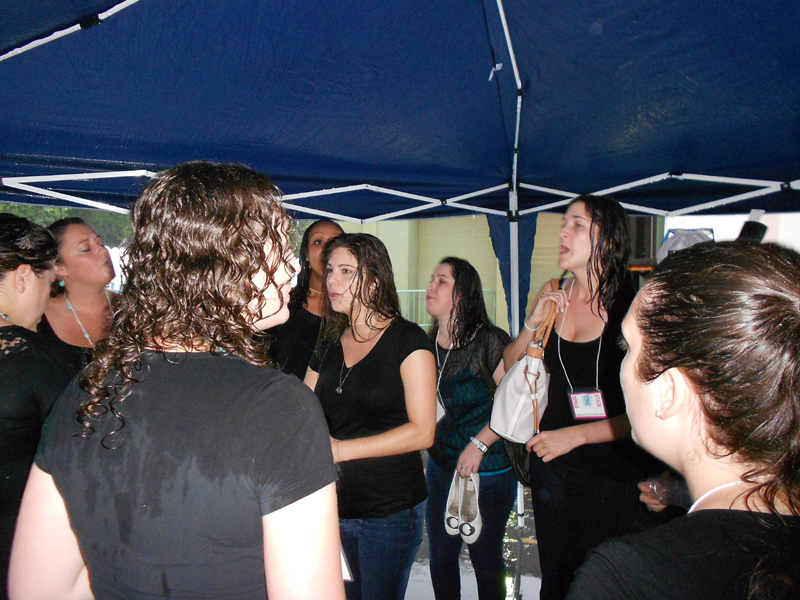 Volunteers opened a small pop-up tent on the stage and the young women continued their serenade. What had seemed doubtful just a few moments before – began to feel entirely possible now – “this will pass.” So, when Pamela Esposito-Amery strode onto the stage, megaphone in hand, and announced “the walk will go on as planned!” – she didn’t have to convince anyone to stay. Because no one was leaving now. Ellen Karis, “Greek Goddess of Comedy,” helped to emcee and to keep the spirits high. Brielle Von Hugel, American Idol contestant, sang the Star Spangled Banner and the 4th Annual T.E.A.L. 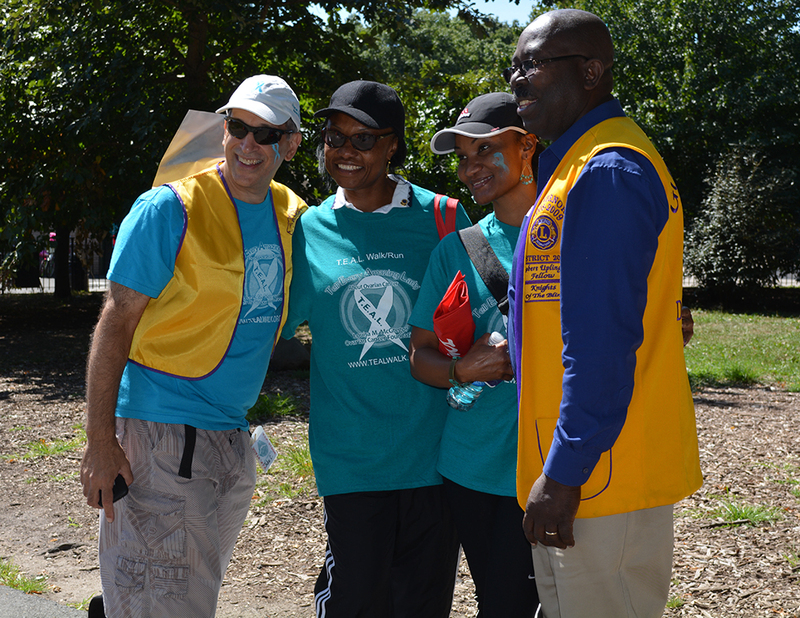 Walk was in full swing. Dr. Sapna Parikh and Stacey Sager, ABC’s Medical and News correspondents, turned from guest speakers into cheerleaders, exhorting the crowd to “Tell Every Amazing Lady!” about ovarian cancer. Brooklyn Borough President Marty Markowitz, who had waited out rain to speak, reminded everyone that New Yorkers (esp. 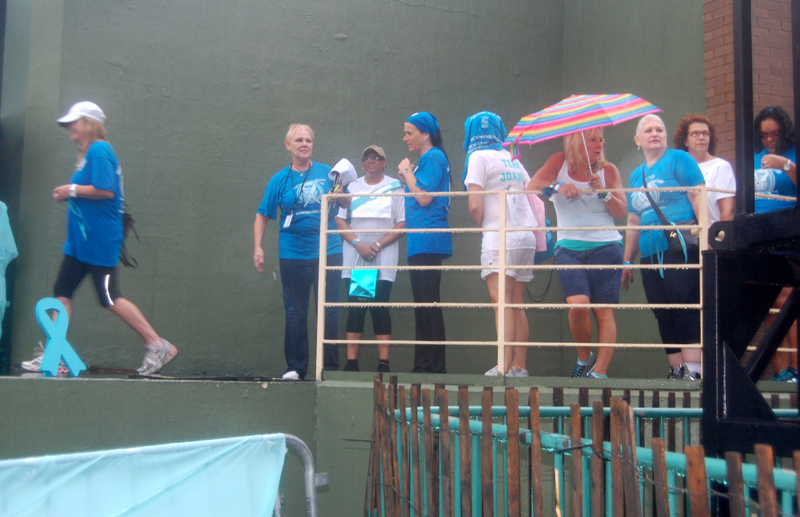 Brooklynites) are a tough bunch, and added, “a little weather – we say – fuggedaboutit!” Ovarian cancer survivors, waiting patiently in the rain to ascend to the stage, echoed his sentiment. Said one, “after what we’ve been through, this is nothing!” And then, as if on cue, the rain ended, followed by a brilliant sun in a cloudless sky. The park began to fill again. 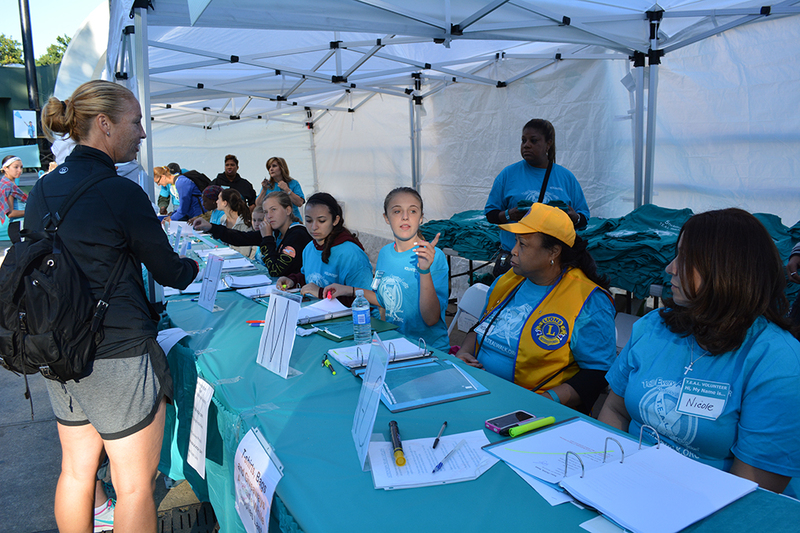 Walkers returning from shelter, expecting to see few people left behind, were astounded to find the midway clogged with teal shirts and banners. The smiles on faces as the 4th Annual T.E.A.L. Walk finally left the starting line were only outdone by those at the finish, as walkers with hands, hearts and signs held high finished a journey that had begun long before today, and had ended in hugs, tears and laughter. This day was for women, for their families and friends, to remember, to honor and to join together in powerful solidarity – to eradicate this disease that “silently” claims the lives of 15,000 U.S. women each year. This day was for people who had channeled their loss and grief into positive action, who honored the memory of their loved ones by reaching out to save others. T.E.A.L. 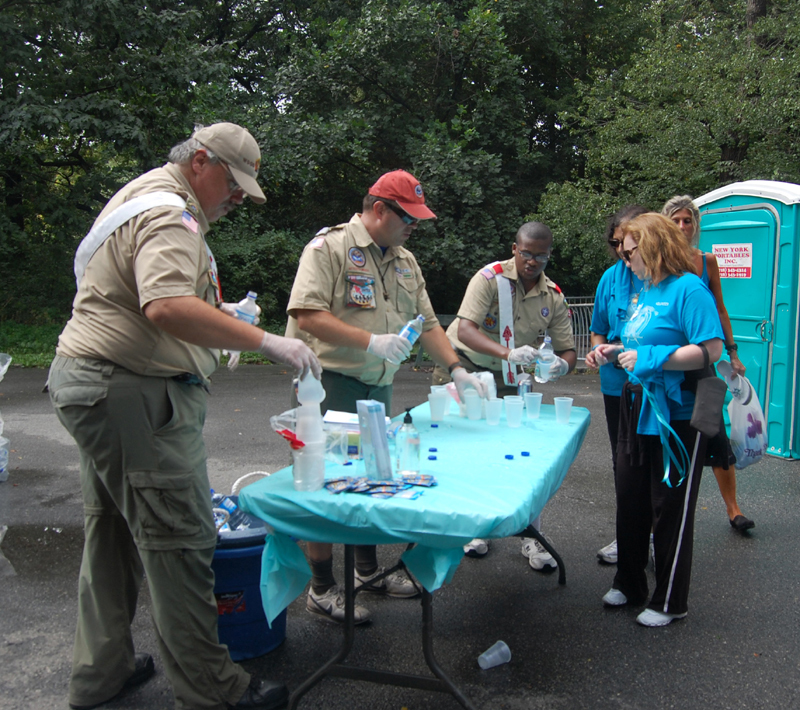 volunteers had spanned the route: Boy Scouts at water stations, Lions and Leos giving out energy bars, photographers, cheerleaders, beauty contest winners, route marshals, and many, many more. 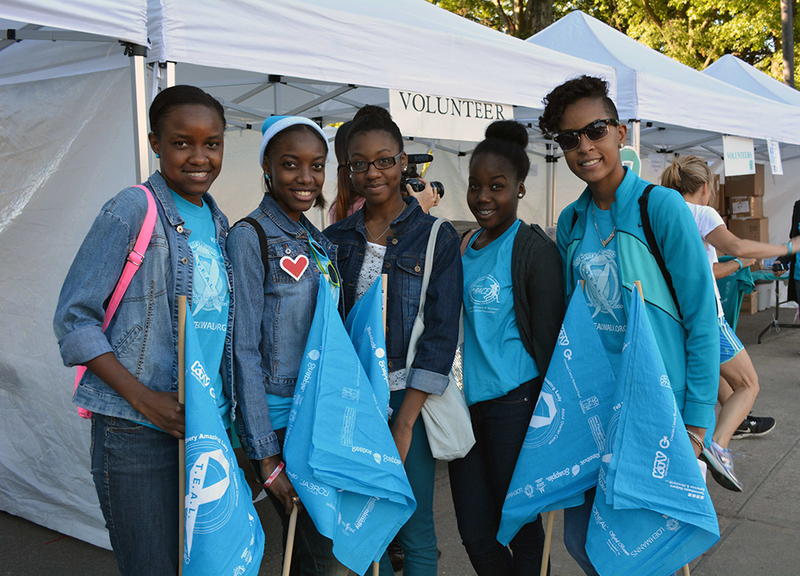 There were volunteers who manned booths for registration, raffles, The T.E.A.L. shop, and who provided information and refreshment. Some came as early as 5:00 am and stayed until the last tents were packed away. 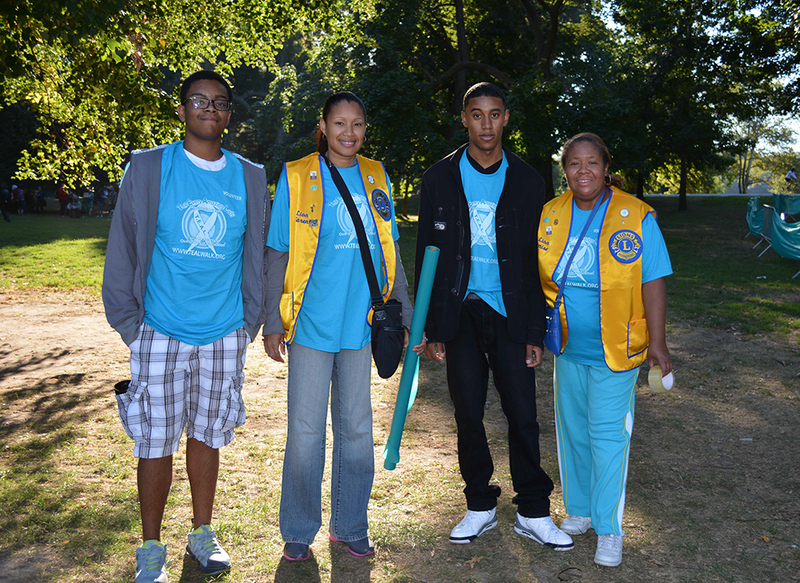 District 20-K1 Lions sent a team for the second year as well as the Hollis Lions and Leos, who helped from early morning. Special thanks to Pamela, to the Esposito, McGregor, and Amery families, and to all the wonderful T.E.A.L. staff and volunteers, who worked tirelessly for this event, who kept it together when all seemed lost. The joy of seeing thousands walk through the park was your long awaited reward. And thanks to all who came to walk, who braved the rain and who kept hope alive. This day belonged to you. It was not surprising that the sun came out today – there really was no other choice. 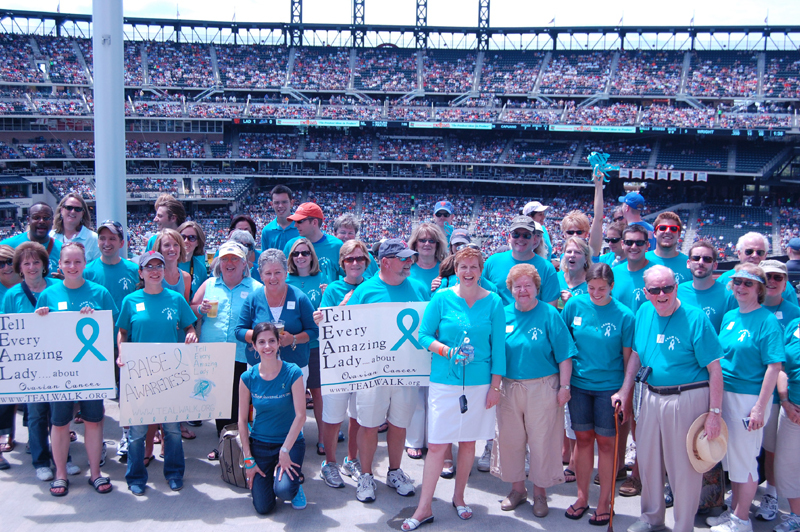 Saturday, July 21 2012 – Streams of teal adorned fans filed into the Pepsi Porch at Citi Field for the 1st Ovarian Cancer Day ever held at the stadium. In the main lobby, fans coming to see the NY Mets play the Los Angeles Dodgers were greeted by tables manned with teal clad volunteers, and left with teal-colored souvenirs and ovarian cancer awareness information. T.E.A.L., the color representing ovarian cancer, is also the acronym for Tell Every Amazing Lady About Ovarian Cancer, the Louisa M. McGregor Ovarian Cancer Foundation, the organization that partnered with the Mets to make this day a reality. It was founded by two sisters, Lousia M. Mcgregor and Pamela Esposito-Amery, after Louisa was diagnosed with the disease. Since its inception, T.E.A.L. has helped to promote awareness, educating thousands about the signs and symptoms of ovarian cancer and has raised over $200,000 for research since 2009. In the pre-game ceremony, the Mets presented Pamela, the executive director, with its Spirit award for the invaluable work T.E.A.L. has done to combat this disease, which claims the lives of 15,000 women in the U.S.alone each year. In addition, the Mets would be donating a portion of all tickets sold by T.E.A.L. for today’s game toward ovarian cancer research and prevention. But even more importantly, the Mets were helping T.E.A..L. share its message of awareness with a national television audience. Ovarian cancer facts flashed on the big board and on digital screens all over the stadium and cancer public service announcements would be made all during the game. As Lisa Galley, an ovarian cancer survivor, stepped up to sing the national anthem, fulfilling her lifelong dream, the dream of Louisa McGregor, who lost her battle with the disease in 2011 – to provide all women with the information needed to save lives – was being carried in the airwaves to homes all across America. It was a fitting tribute for a woman who had reached out far beyond the boundaries of her own illness, to bring the gift of hope to other women. Thanks to all the T.E.A.L. 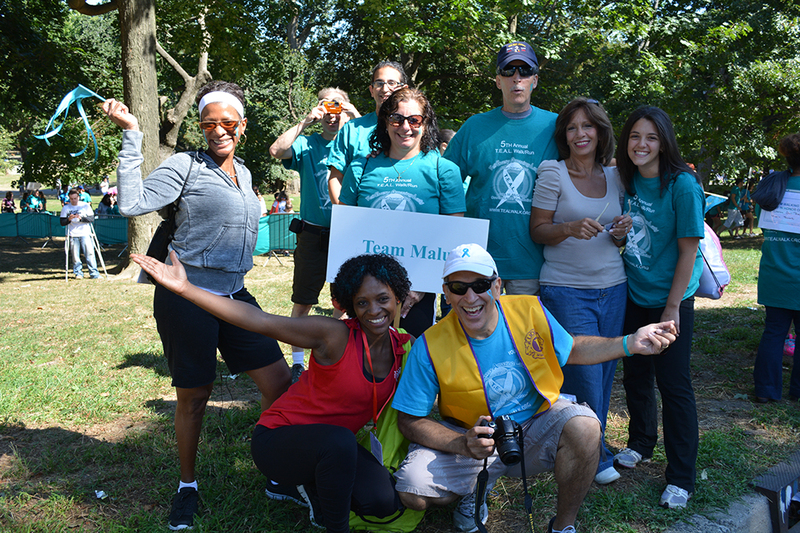 staff and volunteers for their work in putting this day together, to the fans and participants – and a special thanks to the NY Mets organization for making ovarian cancer awareness a special part of its exemplary program of community service.